Stop Happy Monsters is, well, a shooter, in which the object of one's antagonism is a whole slew of colorful, grinning "monsters". What these cheerful, unthreatening-looking things did to merit your unfettered rage is never really made clear, but at the same time, it's not very important either. What is important is that this game is nice-looking, nice-sounding, and, though difficult, good fun. This is one game where graphics are pretty key to its success. 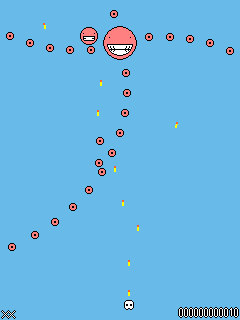 Gameplaywise, it is just a bullet hell game, albeit with a twist or two (namely, that only the bosses shoot, while the regular enemies just tumble aimlessly downward). But graphics-wise, I think it's something special; there is a pseudo-3D look to the tumbling enemies that I find really attractive, and the technicolor explosions are really nice. It's also a cool touch that the player ship is the only colorless thing in the entire game, while the monsters are all vibrantly colorful. The music is also of high quality, and, though not made for the game, fits the game's pace and mood nicely. The sound effects are a somewhat lackluster affair, but then, that could be said about almost any shooter. They do their job, and don't really draw attention to themselves. The gameplay is the game's only weak spot, but to call it such is perhaps making too big a deal of it. It's a fun, simple bullet hell game - if you like those sorts of games, you'll enjoy this game quite a bit, and if you don't, you won't. My complaint is that there's no twist of any sort - not that novelty or complexity is required for a game to be fun, but... well, this game is a bit too simple. You've got one weapon, and there are no upgrades or powerups of any sort. The only variety is in the boss fights, which admittedly are the heart of the gameplay and are in my opinion quite nicely done (though difficult, as is the norm with these things). Ultimately, it's quite a fun game, but there's certainly unrealized potential. If these sorts of games are enjoyable for you, I can basically guarantee you'll like this one - but if you're not a fan, this probably won't be the one to change your mind. Note: arrow keys move, z shoots. Nobody has added StopHappyMonsters as a favorite game yet. Be the first. It's damn hard. I'd like to see someone who's really good play it. Good visuals and audio, but the fact that the hitbox is the entire sprite, combined with the high movement speed is pretty ridiculous. The graphics and sound definitely match the game quite well, but gameplay was extremely difficult. After playing for about 12 minutes I decided I just couldn't play any longer. So any difficulty curve would have been a nice addition. The game does have potential though, if it is ever redone.